Psilocybe Cubensis Mazatapec, also known as Maz, has a rather vague history, but it is said it was first found around Mazatapec, Mexico. 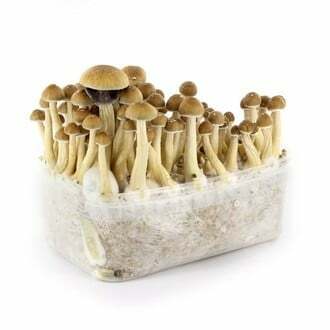 Maz is an easy to grow strain with average size fruit-bodies and a unique characteristic - the caps of this Cubensis stay partially closed. Maz is a classic Cubensis, but for some reason it was never very popular - until today! Now you can grow these magic Mexicans at home and enjoy a spiritual trip. These 100% grow-kits contain 1200ml of 100% mycelium and are ready to grow when they arrive at your doorstep. All you need is the correct temperature (22-25°C), patience and about 3 second to spray some water every day - and the result is an enormous amount of fresh magic mushrooms. These grow-kits produce several flushes.